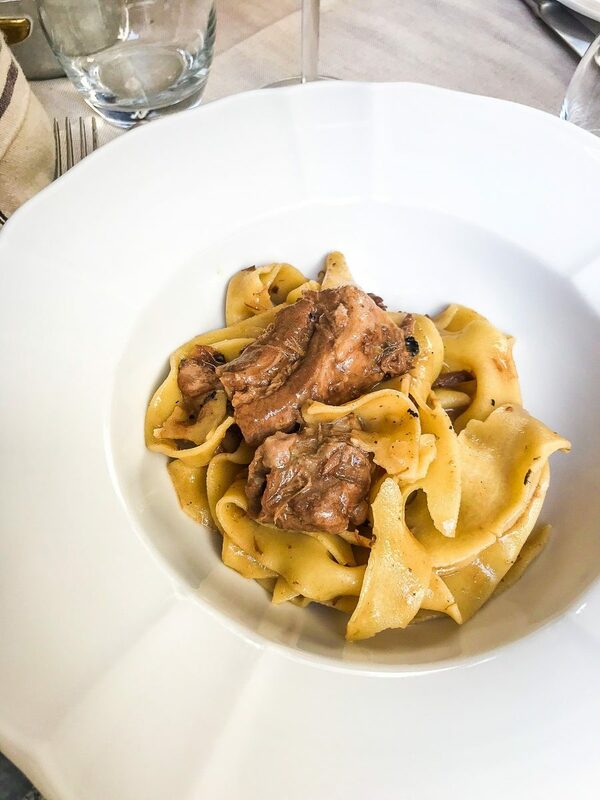 Some of the best food I ate in Italy was during my stop in Florence (although Bologna is a real rival!). There are so many different restaurants, so many fantastically delicious local meats and cheeses to try. 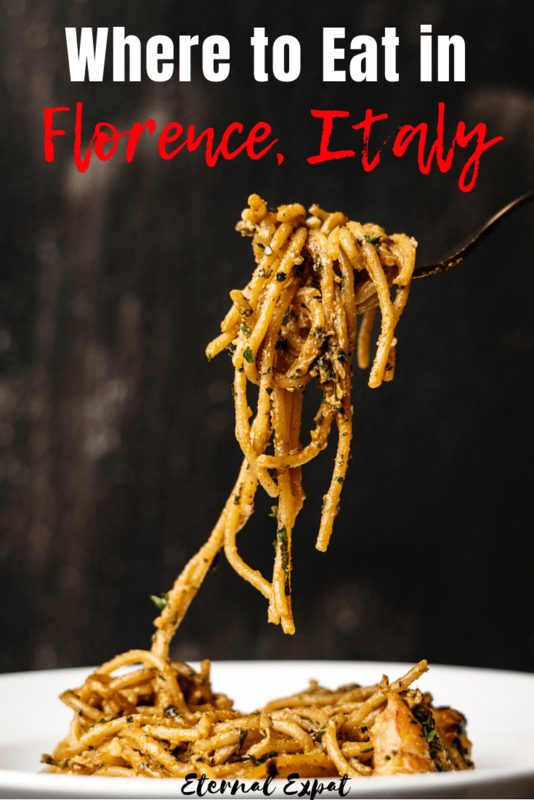 If you’re looking for where to eat in Florence, these are the best restaurants in Florence that I ate at and a few that I really wanted to try but were closed due to the August holidays. There are a few things you may want to consider when planning your meals in Italy. Dinner starts much later in Italy than it does in places like the US. Most restaurants don’t even open until 7 or 8 p.m. If you are feeling peckish, head into a bar for some aperitivo – a drink with some snacks to get the metabolism going. Once you’ve had a drink or two and some meat and cheese, you’ll be ready to eat dinner by about 8 or 9 p.m. alongside the locals. If you find a restaurant that is open and busy at 6 p.m. it’s likely catering just for tourists and may not be as good as some of the others that cater more for the Italian locals. 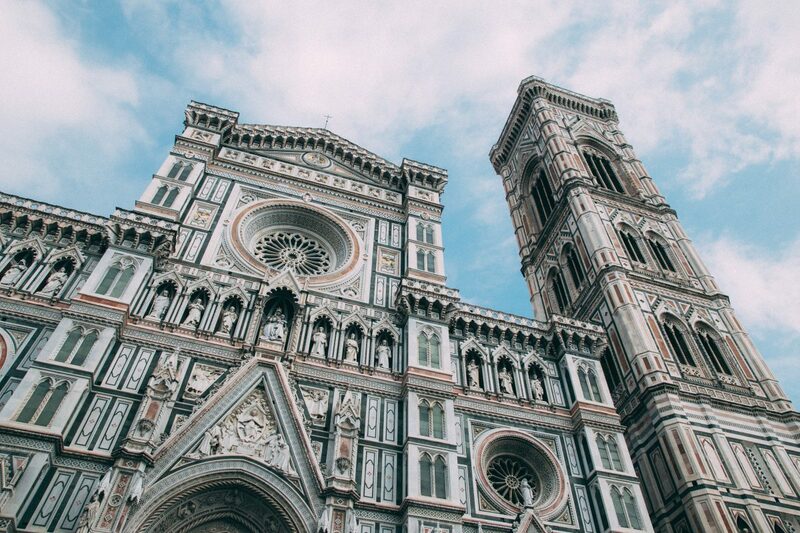 My Airbnb host in Florence gave me these words of wisdom alongside her restaurant recommendations: don’t eat anywhere near the Duomo or the Basilica di San Lorenzo. 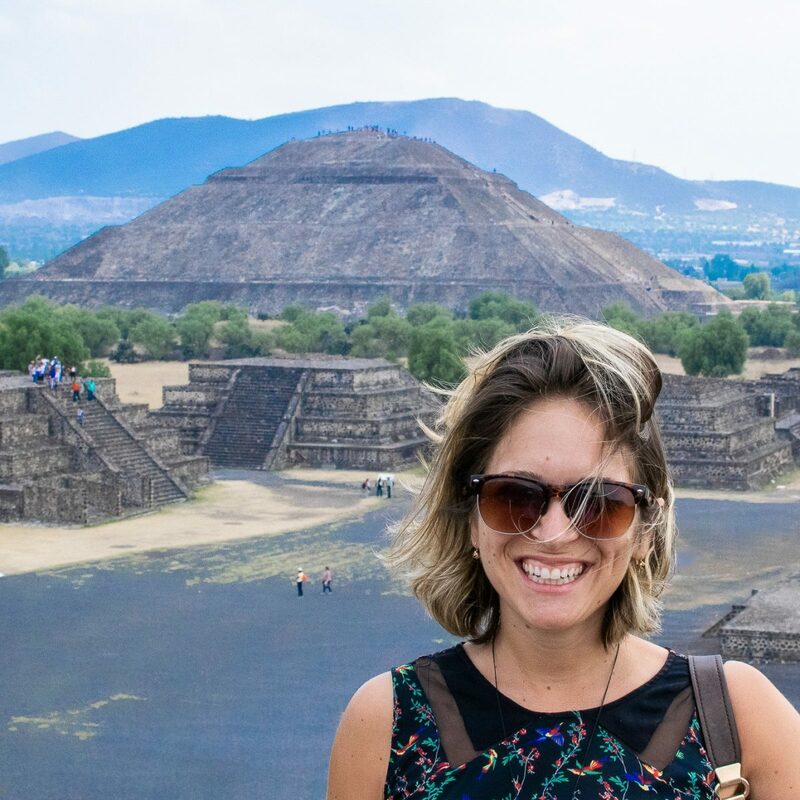 They are the most touristy parts of the city and the restaurants there are notoriously overpriced and not great. She said instead, take a walk a bit further from those places and you’ll likely find great food. She promised that you will almost always find a good meal near Santa Croce. Head into a market and eat where the locals eat – one of the most popular places for lunch is Sant’Ambrogio Market. There are tons of places inside making fresh sandwiches or little meat and cheese platters. This is perhaps one of the most famous restaurants in Florence. It comes up on most lists of “best restaurants in Florence” and was recommended to me on several occasions. Try to make a reservation the day before if you can or ask your hotel or Airbnb host to call ahead of time for you if you really want a reservation on the weekend (unless you speak Italian, in which case go ahead and give them a call). The thing I like about this place is that in addition to having their fancy restaurant, they also have a more casual trattoria with a very similar menu right next door. 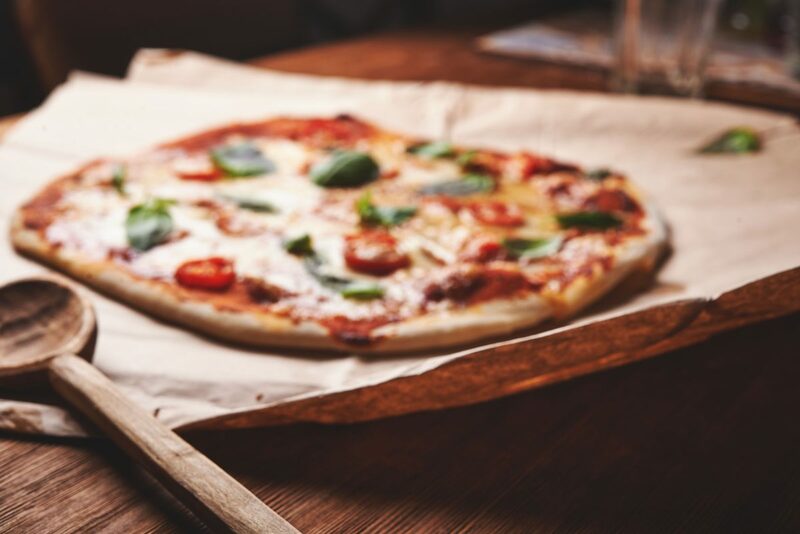 If you don’t want to spend a ton on dinner or you simply want to enjoy great food in a casual environment, head to Cibreo bar and trattoria. Both the trattoria and the restaurant serve up classic Tuscan dishes and have a really nice selection of wines. The delicious pizzas we had at Santarpia. Those yellow tomatoes were some of the juiciest tomatoes I’ve ever had! 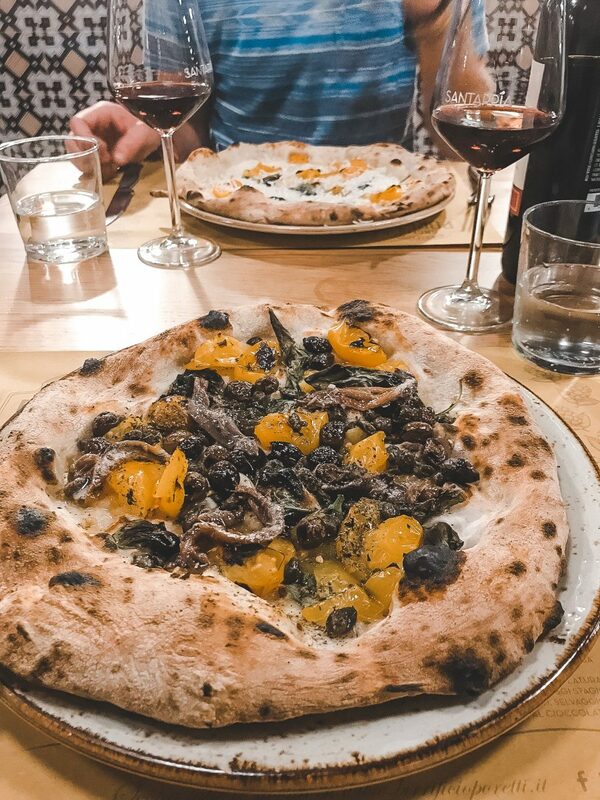 For some seriously great Napolitan-style pizza, get yourself to this popular spot near Piazza Santa Croce. It was perhaps one of the best pizzas I’ve ever eaten. They have tons of different toppings including ones with fresh local tomatoes, anchovies, local cheeses, and beautiful slices of cured meat. Not to mention that the crust is truly glorious. If you like a thick crust with not too much sauce getting in the way, you’ll love the pizza here. It’s worth noting that unless it actually says sauce or tomato on the menu, then the pizza doesn’t have a red sauce on it. We didn’t realize that would be the case, but the toppings were so fresh and the dough so wonderfully cooked that the pizzas really didn’t miss the sauce. Santarpia is also nice because they have a nice wine selection and a couple of locally brewed beers on draft. Of all of the cities we went to, I think I liked the craft beer in Florence the best. It’s worth noting that they also make gluten-free crusts if you ask. We ate here on our last night in Florence and that’s probably for the best because otherwise, we would have eaten every single meal here. The food was out of this world good. The staff was friendly and attentive. The wine was delicious, the pasta was perfectly cooked and so fresh. The sauces, the meats, the cheese, the tiramisu. I could go on and on about this place. It was actually recommended to me by a follower on Instagram and I’m SO grateful for that recommendation because our meal here remains one of the best that I had during my 10 days in Italy. You don’t need to make a reservation, there is plenty of seating. This was one of the best places for a bowl of fresh pasta that we found. It has tables out in the street. When you sit down they bring over a glass of prosecco and a bowl of freshly made potato chips (on the house!). I really like their tagliatelle as well as their ravioli. We tried both their pasta and their pizzas and I can confirm that both are delicious. Just steer clear of the pannacotta. It’s not delicious. 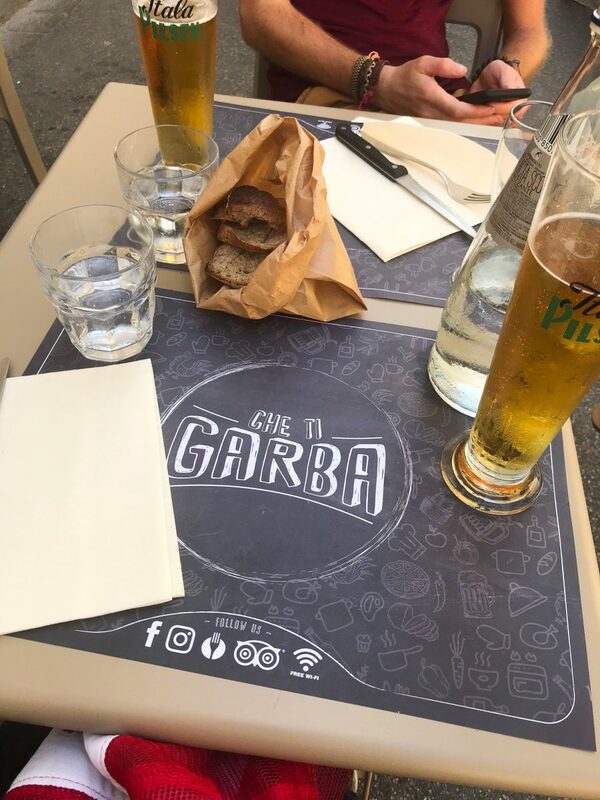 Another nice thing about Che ti Garba which was perfect for those hot summer days was that they had nice light Italian lager on draft. You would be surprised at how hard it is to find a nice cold lager on draft in the city center. While I love a bit of craft beer, sometimes you just want a cold, crisp Peroni. We stumbled upon this place by accident and I’m so happy that we did. Everything here, from pasta to meat, to pizza, cheese, and even the wine is bio or as we say in English, organic. The pasta is made fresh in-house. The wine is mostly local and very, very tasty (also relatively inexpensive). The meats that they served with the pasta dishes were so perfectly cooked, so juicy. The sauces were packed with flavor. The wait staff were incredibly helpful. We overheard our waiter speaking English to us, Spanish to the table next to us, Italian to the table inside, and French to the guests that arrived when we were leaving. 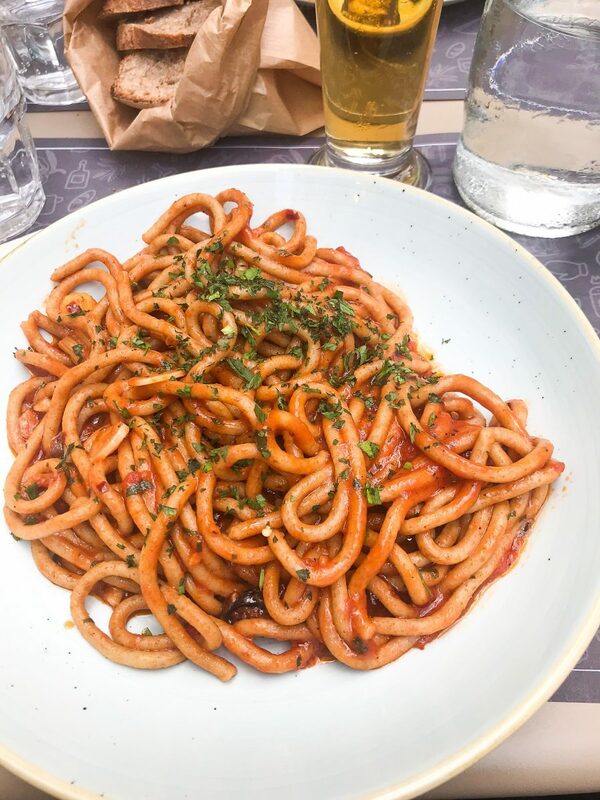 If you’re looking for a place that’s not too far of a walk from the Duomo and all of the sites in the center, but serves amazing food at a reasonable price, I highly recommend Simbiosi. Just note that the entrance can be confusing because there are several spots with outdoor seating. The entrance is on Via de’ Ginori. 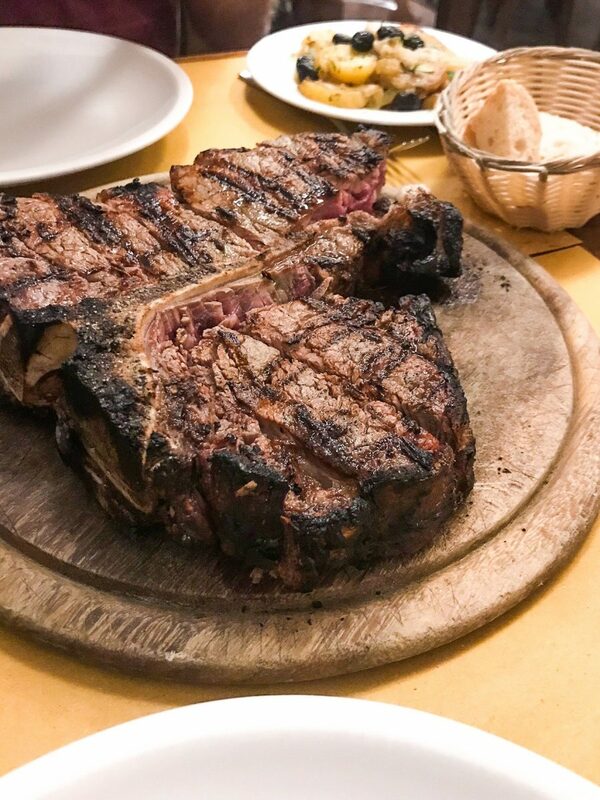 We were recommended this spot by our Airbnb host as THE spot to go for Bistecca Fiorentina – Florentine steak. So that’s exactly what we ordered. It was a solid 1.5kg of steak that Luke and I shared between us with some bread, a half a liter of wine, and a side of potatoes. It was utterly divine. Don’t you dare tell the waiter how you want your steak cooked. The Bistecca Fiorentina is only cooked one way, medium rare (and basically blue once you get near the bone. It’s a T-bone steak that is charred to perfection on the outside. It was tender, very well seasoned, and really just one of the best steaks I’ve had. If you’re looking for a place to get this local dish, I highly recommend Osteria de Benci. The wait staff weren’t particularly attentive, but they were nice and spoke a bit of English. It’s also incredibly reasonably priced considering the quality of the meat. For half a liter of wine, the 1.5kg steak, a side of potatoes, bread, and sparkling water, we paid less than $100. They also serve up plenty of other local dishes. Tables next to us were enjoying fresh pasta, beautifully platters of meat, and they also have a few pizzas on the menu. They are very family-friendly and there were several families in when we were there using booster seats and high chairs provided by the restaurant. Unfortunately, I didn’t get a chance to try this little restaurant since it was closed for the August 15th holidays (seriously, don’t go to Florence in August). However, it came highly recommended by several people and is supposed to serve up some seriously good local eats. It’s solely a lunch spot, so be sure to get there early so you don’t miss out on the delights like we did. You can get the famous Florentine tripe sandwich, Lampredotto. If that’s not your thing (it’s not my thing), you can try the most delicious local cheese, stracchino and dip into with fried bread called Coccoli. They also make other types of sandwiches with locally sourced cured meats.